Apple has significantly improved upon last year's original iPhone while extending many of the benefits of its newest model to existing users in the form of the iPhone 2.0 software update. AppleInsider's week-long "Inside iPhone 2.0" series will present a detailed analysis and review of the iPhone 3G, the 2.0 software, the App Store, and push messaging. This first segment looks at the iPhone 3G hardware itself, what's new and different, what's bad, and what's missing. A followup segment on hardware will look how the new iPhone 3G compares to other smartphones, and whether it's worth the upgrade for existing iPhone users. Audio: In response to complaints that the original iPhone was too quiet and had only fair sound quality, Apple has improved the iPhone 3G's mic and speaker. The new model is considerably louder compared to the original iPhone; at half volume, it sounds about as loud as the previous design. Turned up all the way, the speaker plays back clear, crisp sound that's loud enough for listening to music while sitting at a desk without using earphones. The previous model was barely audible unless held close to your face. The new speaker and mic now sit behind two small and recessed openings next to the dock connector (below, blown up in highly unflattering, close-up detail). Both are still mono, and still highly directional. If you inadvertently cover the tiny speaker opening on the bottom left corner with your finger (which is easy to do when holding it), you can block the sound almost entirely. 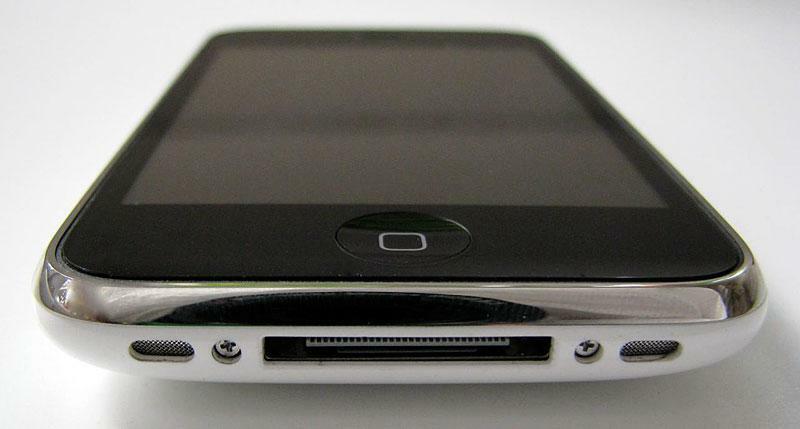 The new iPhone 3G also uses a standard, flush-mounted headphone port that is more broadly compatible with replacement headphones that use a right angled jack. The included headphones with built-in mic are the same as the original iPhone's. 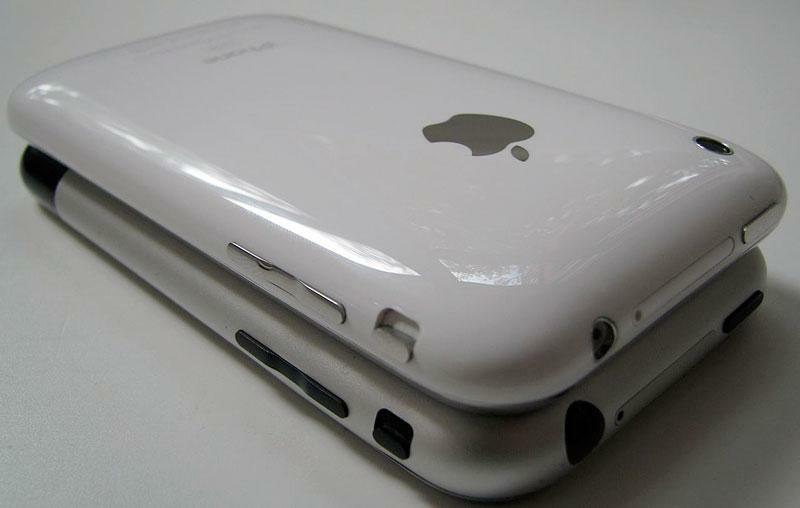 Appearance: From the front, the new iPhone 3G looks nearly identical to the existing model. No new buttons, no smaller screen or dual cameras as predicted by rumors, just the same 3.5" 480x320 multitouch screen framed by a slightly more minimalist beveled edge that creates the illusion that the new iPhone 3G is wider. 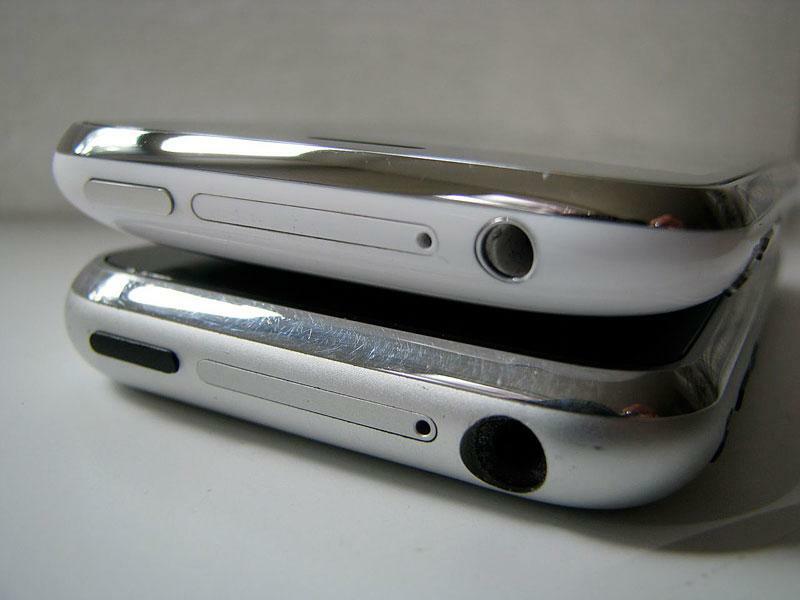 Like the iPod touch, the iPhone 3G now has a wider black margin around the screen. It still has the chrome edging of the original iPhone, but the shiny ring is subtly dialed back on the new model. It also now has a chrome finish on the previously black volume control, silent switch, and the top-mounted power button. Size, Shape, & Feel: The new unit is two hundredths of an inch thicker in the middle, but thanks to its rounded back (now in plastic rather than aluminum) the device feels significantly thinner and more comfortable to hold. Plastic also conducts less heat than aluminum, so it feels warmer; the original iPhone's metal back wicked heat from your fingers, making it feel sterile and frigid. The round back also rocks slightly when set on a flat surface and poked at, but not to the extent of making it impossible to use as a desktop calculator. 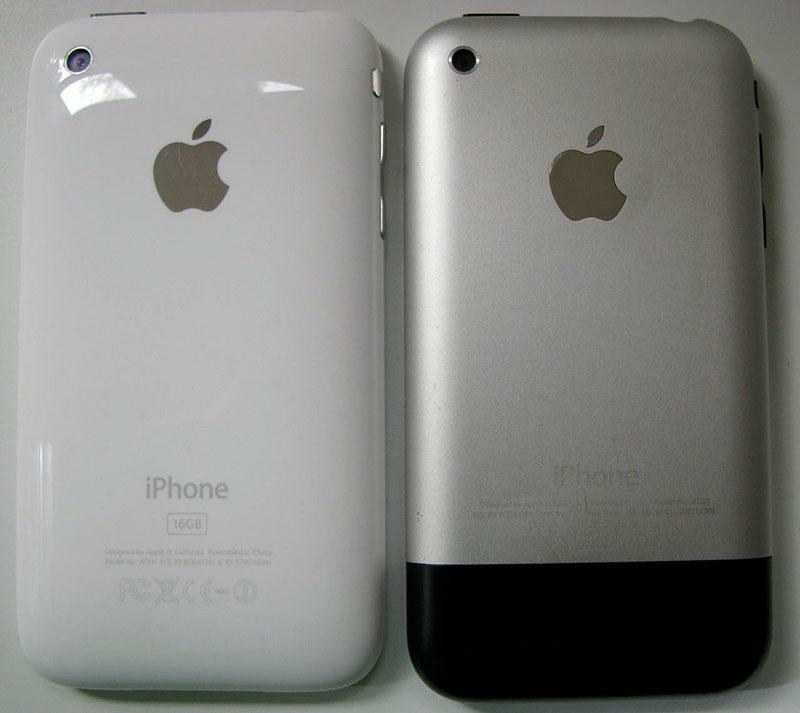 While the original iPhone looked like a box with rounded edges and corners, the back of the new model is curvaceously rounded everywhere apart from its flat front. The original model's tight chrome framing and squared shape gave it the feel of a solid, narrow box. The new 3G's smooth, rounded back and looser chrome frame creates the illusion that it is wider and flatter, despite being essentially the same size. Color: The polished plastic back, available in shiny black (for either the 8 GB or 16GB version) or in a polished white (with the 16GB version only), attracts smudges and fingerprints like the face of the existing iPhone, and looks like it will collect scratches like the mirrored aluminum back of original iPods, although so far it seems to be fairly resistant to scratching. The highly reflective, emo black is particularly bad at showing smudges and fingerprints, while the hipster creamy white version is quite good at hiding marks and subsequently looks a lot cleaner. Weight: The new unit is two grams (.07 oz) lighter than the old one, in part because of the plastic rather than aluminum shell. Two grams isn't much (that's how much two dollar bills weigh), but along with the slightly more aerodynamic shape and its new materials, the shape and weight of the new iPhone makes it feel significantly lighter and more comfortable to hold, but also a bit less substantial. Radio reception: The warmth and dropped weight from the plastic back isn't its only advantage; the iPhone 3G also gets slightly better mobile (and significantly better WiFi) reception. In areas where AT&T's service dropped off into a black hole of silence for the original iPhone (a common phenomenon around San Francisco), the new iPhone 3G reports maintaining a usable signal of a couple bars, although there are still dead zones to discover. Using WiFi, the 3G unit not only had a wider usable range, but also was able to hit consistently higher throughput numbers at the same distance from the base station as an original iPhone, sending test files two to four times faster to web-based testing services. From outside the house, our iPhone 3G received 5 Mbit connectivity from an AirPort Express base station located one floor up and about 80 feet deep into the house through two partition walls, while an original iPhone in the same location could only manage a barely usable 1.3 Mbit. On page 2 of 5: External hardware disappointments: the bad news; Unchanged hardware details; Fewer Included Parts; Camera; Bluetooth; and Battery replacement.